The protests have hit major French cities, causing considerable damage for the past three weekends. The “gilets jaunes” (yellow vests) protests have now grown to reflect more widespread anger at the government. 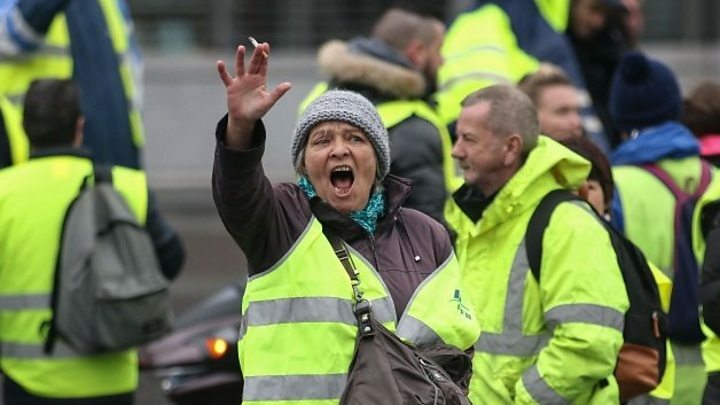 “Yellow vests” are so called because they have taken to the streets wearing the high-visibility yellow clothing that is required to be carried in every vehicle by French law. Mr Macron has accused his political opponents of hijacking the movement in order to block the reforms. What did Mr Philippe say? Mr Philippe announced the measures in a TV address after meeting MPs from the ruling party, La Republique en Marche. He said the six-month suspension would be applied to fuel tax increases, as well as hikes in electricity and gas prices and strict vehicle emissions controls. But he said the violence must stop. “The main role of the state is to guarantee public order but we must fight against anything that endangers the unity of the nation,” he said, adding that any future demonstrations should be declared officially and carried out peacefully. Mr Philippe added that a public consultation would be held on taxes and public spending from 15 December until 1 March. The protesters had been waiting for the president to enact the next step in the elaborate pas-de-deux which is French social negotiation. What the ritual required was a gesture from the government that showed that it had not just listened, but was prepared to appease. That is how, since time immemorial, French social conflicts have been resolved. Bruno Retailleau, the Senate leader of the centre-right opposition, the Republicans, said the suspension was “absolutely inadequate”. Far-right leader Marine le Pen concurred, tweeting (in French) that a postponement, rather than cancellation, of the tax did not go far enough. Segolene Royal, former ecology minister for the centre-left Socialists, welcomed the move but said the tax should have been put on hold from the beginning. The “gilets jaunes” movement began as a protest against a rise in duties on diesel – which is widely used by French motorists and has long been less heavily taxed than other types of fuel. Mr Macron says his motivation for the increase is environmental, but protesters call him out of touch – particularly with non-city dwellers who rely on their cars. The movement later grew to reflect a range of grievances, including the marginalisation of rural areas, high living costs, and general anger at President Macron’s economic policies. The protests have no identifiable leadership and gained momentum via social media, encompassing a whole range of participants from the anarchist far left to the nationalist far right, and plenty of moderates in-between. Nearly 300,000 people took part in the first countrywide demonstration. There were more than 106,000 a week later, and 136,000 people last Saturday. Do the protests show any sign of stopping? Protests continued into Monday. About 50 “yellow vests” blocked access to a major fuel depot in the port of Fos-sur-Mer, near Marseille, and petrol stations across the country have run out of fuel. Students in about 100 secondary schools across the country held demonstrations against educational and exam reforms. Changes affecting ambulance drivers are also part of a raft of reforms by President Macron. Private ambulance drivers staged further demonstrations on Monday against a range of social security and healthcare reforms they say could affect their services. It is unclear whether the groups of students and health workers have directly aligned themselves with the “yellow vests”. One member of the movement, a man in his 20s, is in a critical condition in hospital in Toulouse. He was injured in a clash with police. What were the changes that caused this anger? The price of diesel, the most commonly used fuel in French cars, has risen by around 23% over the past 12 months to an average of €1.51 (£1.32; $1.71) per litre, its highest point since the early 2000s. World oil prices did rise before falling back again, but the Macron government raised its hydrocarbon tax this year by 7.6 cents per litre on diesel and 3.9 cents on petrol. Mr Macron has blamed world oil prices for three-quarters of the price rise but said more tax on fossil fuels was needed to fund renewable energy investments. The decision to impose a further increase of 6.5 cents on diesel and 2.9 cents on petrol on 1 January 2019 was seen as the final straw for the protesters.